FALCON. A bird of prey with long powerful wings used for swift and agile flight. Historically, falconry was a popular sport and status symbol among the noble of medieval Europe, the Middle East, and the Mongolian Empire. BOMBERG designed BOLT-68 FALCON with one thing in mind: to hunt. Different than other watches, BOLT-68 FALCON is bold and rich in history. Its gold framed real Indian numbers, stainless steel or Black PVD case with grenade finishing topped off with a black or sand leather strap make it stand out above the pack. BOLT-68 FALCON transports us straight into the middle of an ardent desert. Its medallion and chain designed with falcon details have made this timepiece a true piece of art. Limited to only 250 pieces each, the three references have Swiss made automatic movement for a pure watchmaking experience. 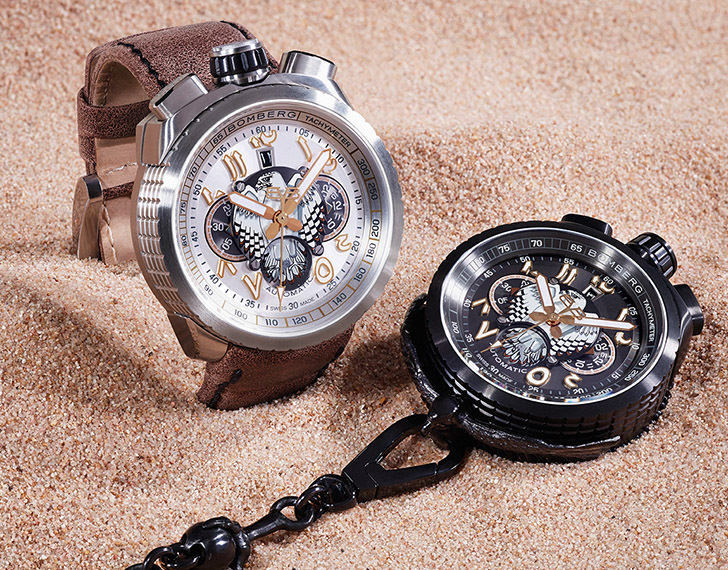 BOLT-68 FALCON edition is an unconventional design: the individualistic strong trademark that is BOMBERG.